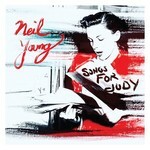 Songs For Judy is a thoroughly engaging collection of live acoustic performances culled from Neil's November 1976 solo tour and features twenty-two songs recorded at various cities along the tour. This song cycle of live recordings is particularly powerful and unique. Young had spent much of the year traveling around the world on tour with Crazy Horse. When touring on his own, he recharged and focused on songs that would not surface in recorded form for several years. Of the albums many treasures, "No One Seems To Know" would not see the light of day until now and it remains unreleased in any other iteration. The raw versions of the tracks found on Songs For Judy reflect an artist completely unvarnished and unafraid to allow the songs to breath and to find their own shape when performed in a solo setting. Songs written in that era would come into focus and then seemingly disappear only to re-enter Young's orbit somewhere down the road. "White Line" and "Give Me Strength" are such examples of finding the light in 1990 and 2017 respectively. It's also fascinating to hear Young revisit early gems such as Springfield's "Mr. Soul" ('67), "Here We Are In The Years" ('68), and "The Losing End" ('69) from some of his earliest solo recordings which remain as timeless as ever.